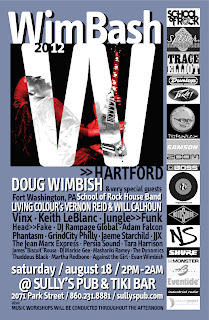 Wimbash>>Hartford will host over 20 artists/ bands on two stages featuring performances by Grammy Award winning Living Colour’s Vernon Reid and Will Calhoun, The School of Rock House Band from Fort Washington, PA and a special surprise musical guest. Artist clinics from 2 pm to 6 pm hosted by musicians will feature programs in music production, bass, guitar, drums, percussion, vocals, keyboards, effects and tone and programming. Stuart Spector from Spector Bass and David Koltai from Pigtronix will be in attendance for product demo/ discussion and to offer up a hello! A sponsor area featuring Doug’s sponsors will be set up for showcasing products, brochures and merchandise. 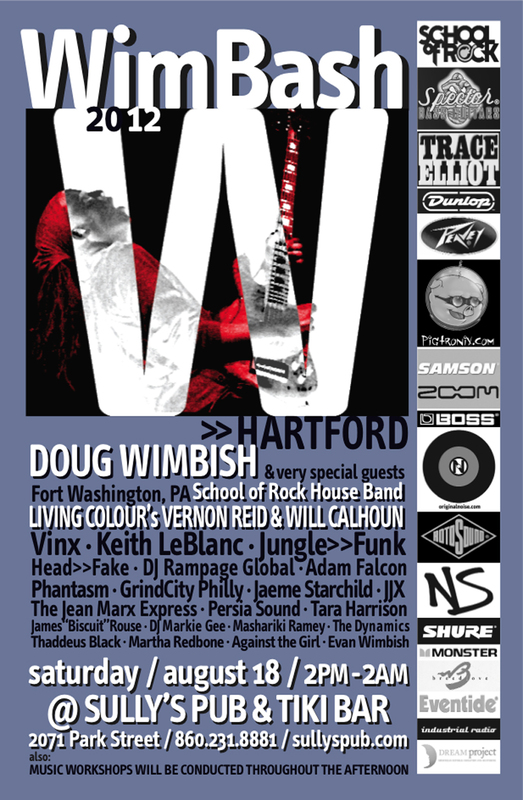 Give aways and raffles featuring products and merchandise offered by Doug’s sponsors will be held thruout the event.